JANET Pyke is up to her eyeballs with bowls for a Perth charity event which will raise money for Foodbank WA. 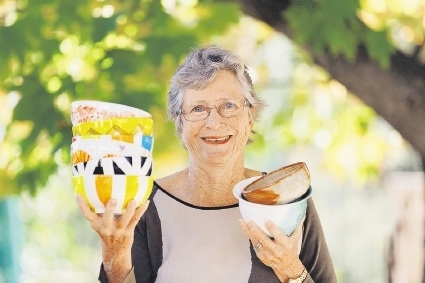 The Dalkeith resident has more than 500 bowls in her garage and stacked on the dining room table ahead of her inaugural Empty Bowls Perth charity event this Sunday. Ms Pyke said everyone was invited to Christ Church Grammar School refectory to enjoy a delicious soup and bread lunch and take home their specially chosen bowl for $20. All money raised will go to Foodbank WA. “One day I found $5 on the ground so I offered to buy my friend a cake,” Ms Pyke said. “Unfortunately, there are children arriving at schools without breakfast and this affects their ability to learn. Ms Pyke said she had been overwhelmed with support for the project, with everyone from Moerlina School students to local AFL stars volunteering to make and hand-decorate bowls. Twenty bowls signed by West Coast Eagles and Fremantle Dockers coaches and players are being auctioned online, including 2014 Brownlow medallist Matt Priddis and Matthew Pavlich.